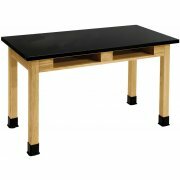 Science Lab Tables with chemical-resistant tops provide an exceptional work surface for science experiments. Select models feature built-in book compartments for students to store their notes and textbooks. 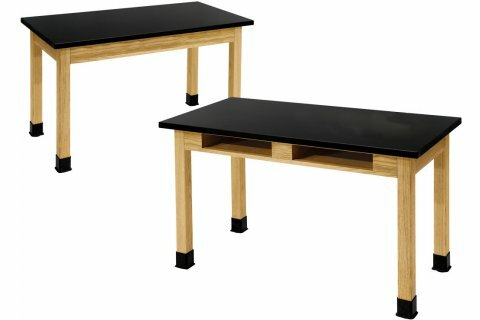 Furnish your school's lab with National Public Seating's attractively finished SBT series for a safe and functional science classroom. 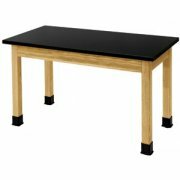 Compare these ChemRes Laminate Top Tables with other science lab tables using the chart below. Chem-Res chemical-resistant, laminated tops are resistant to most chemicals and stains, but have limited resistance to high temperatures and severe chemicals. Chemical-resistant solid phenolic tops are highly impervious to most chemicals, acids, stains and moisture but have limited resistance to heat. Solid Epoxy Resin tops are completely impervious to most chemicals, acids, normal laboratory heat and moisture, showing no effects when subjected to the following chemicals: Hydrochloric Acid 20%, Sulfuric Acid 60%, Methyl Alcohol, Nitric Acid 70%, Benzene, Toluene and many more. Strong: Heavy-duty, 13-gauge corner braces make tables rigid as steel. Water-Resistant: 1 1/8" high pressure laminate tops are water-resistant. Chemical-Resistant: Tops are also resistant to many common chemicals such as Acetic Acid, Sodium Hydroxide, Hydrochloric Acid and other chemicals. However, limited resistance to high temperatures and severe chemicals. Sturdy: Solid Ash 2 1/4" x 2 1/4" legs and aprons. Adjustable Glides: Adjustable leg glides for accurate leveling.